I've been coloring a bunch this last week thanks to the 30 Day Coloring challenge at the Daily Marker and I am building up a collection of images to use on cards. A couple of the images that I colored up were these cute little ice skating mice from Clearly Besotted. I haven't done a shaker card in a little while so I decided to make one here. I took a panel of white card stock and used some MFT dies to make a window panel and also add a scallop detail to the outside. I laid the window panel over a top folding A2 card and used a light marker to put a dot on each corner inside the cutout. Then using the little dots as guidelines, I stamped some trees and free handed a horizon line between them. I wanted the background to fade in a bit so I used colored pencils to color the trees and ice. For the window, I cut up a piece of packaging from a stamp set I had left over and taped that in place over the cutout. Then lots of foam tape on the back of the panel before I put sequins in the window and laid the card on top. I stamped the sentiment below the window and adhered the mice to the window. 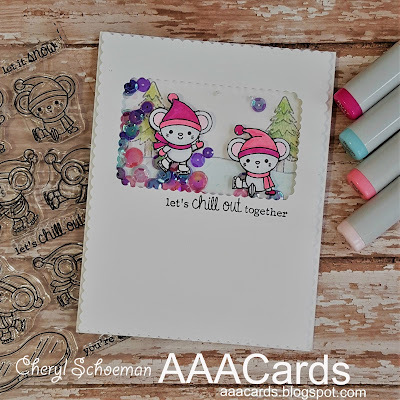 The AAA Cards design team has some great inspiration for you and we have a wonderful guest designer, Milla. Please give them a visit and leave them some comment love :) Can't wait to see what you come up with for this challenge. Thank you so much for visiting here too! Awww, such a sweet card, Cheryl! Love the cute mice (the one on the right looks like me when I'm iceskating... ;) ). 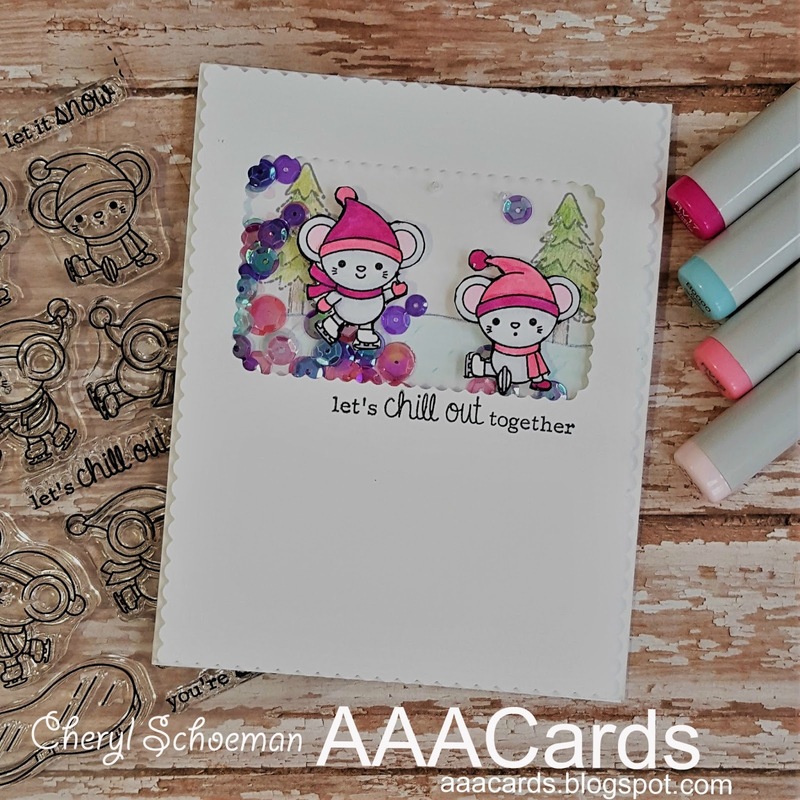 Thanks for having me as a Guest Designer at AAA Cards!